Adobe Lightroom is a powerful, intuitive program used for enhancing, organizing, and editing your photos. Users can render enhancements on everything from smartphone photos to raw DSLR images. This course explores many of the exciting features this program offers. Take a look at just a brief summary of the course content below. Students are provided with an overview of learning objectives and some of the key features that the course will explore. Students learn to create and configure catalog settings and Lightroom preferences. We also introduce students to the Import Dialog and many of the important customization presets that can be applied to images. This includes file handling, file renaming procedures, metadata presets and other import options. This section provides an in-depth overview of file formats and color spaces relevant to photography and Lightroom. We explore the various pros and cons of compressed vs. RAW data formats. Students learn to effectively work with color profiles intended for both screen and print publishing. We provide a comparison of key color spaces including, sRGB, Adobe RGB, ProPhoto RGB, CMYK and Lab Color. Students also learn to configure Lightroom's External application list, to export and edit images from Lightroom to third party applications. Students learn to customize and configure the Lightroom interface using the preferences panel, identity plates and image watermarks. This section introduces students to one of the most important modules in Lightroom, the Library. Here, students will import a gallery of images into Lightroom and apply several sorting attributes to filter and organize images. Students learn to work with keywords, keyword sets, color labels, flags, and metadata. From there, students learn to create collection sets, collections, smart collections and custom filtering rules to master advanced filtering techniques. We also explore automated watch folders, and smart previews to edit images off-location. Students are introduced to the Quick Develop panel to make basic adjustments in the Library module. 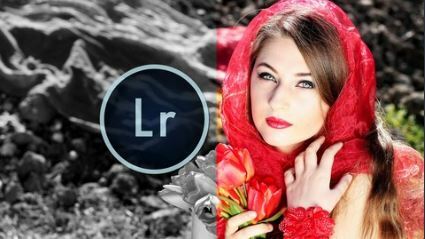 Students learn to master Lightroom's Develop module to perform stunning photo enhancements using a number of professional techniques. We start by teaching development presets, creating snapshots and exploring the history panel. From there, we explore screen modes, and different views to edit and compare images while making adjustments. We present an in-depth look into Lightroom's image histogram for making accurate image corrections using exposure and white balance adjustments. We explore many exciting tools including, crop overlay, spot removal, clone tool, red eye reduction, graduated filter, radial filter and the adjustments brush. Students will have the opportunity to use these tools in a number of exercises, designed to transform ordinary images into stunning, studio quality work. In addition to the tools, students will also work with a number of other adjustment panels to adjust tone curves, HSL, noise reduction, lens corrections, image transformations and artistic vignettes. We also explore RAW file white balance adjustments and color calibration. Students are introduced to metadata modifications, and writing data to XMP Sidecar files. Students learn to geotag images and plot them on a Map. We explore map views, filtering and creating saved locations for custom filtering using GPS. This section teaches students to create breathtaking photobooks using Lightroom's book module. We explore custom book layouts, book formatting, and applying text and background effects. Students also learn to export books as PDF documents, JPEG files or upload directly to Blurb. Students learn to create customized slideshows using the Slideshow module. We explore custom templates, layout options, text overlays, intro screens, embedding audio, video and a number of playback methods. We also explore methods to export the slideshow to render high-quality presentations. This section explores effective techniques to print images using preset and customized print layouts. Students learn to soft-proof images to ensure color calibration between the monitor and printer. We also demonstrate working with layout styles and page options for optimal quality photographs. Students learn to create and publish web photo galleries with ease, using Lightroom's Web Module. We explore custom layout options, color palettes, output settings and uploading. This section teaches students to use a number of publish services built into Lightroom. Students learn to automatically upload and share images instantly to Facebook and Flickr. We also explore publishing images to local and external storage devices, email, and CD/DVD. Students learn to setup an in-home studio by connecting their camera directly to Lightroom. This course is best suited for beginner to intermediate users. No prior knowledge or experience with Adobe Lightroom is required for enrollment. All working files and a download link to a free trial version of the software is included. The course is compatible with any version of Adobe Lightroom above 5.0 on MAC or PC. Adobe Lightroom Masterclass - Beginner to Expert rapidshare mediafire megaupload hotfile download, Adobe Lightroom Masterclass - Beginner to Expert torrent emule download, Adobe Lightroom Masterclass - Beginner to Expert full free download, Adobe Lightroom Masterclass - Beginner to Expert rar zip password or anything related.